31 Jan / 2019(549)…Cricket’s fourth format(Day/night Test)has been result oriented. There has been scarcity of drawn test matches in last few years. Since World Cup 2015 only 15.26 % drawn test matches. Last year (2018)in 48 tests there were only 5 drawn test matches(5/48 = 10.41%)including two day/night matches. The advent of day-night test has created an interesting situation for test matches. In 11 test matches, not a single drawn game!. Cricket’s fourth format – A Test match that is played under-lights using a pink ball is combination of test match and limited over matches. Cricket’s fourth version or fourth format!. 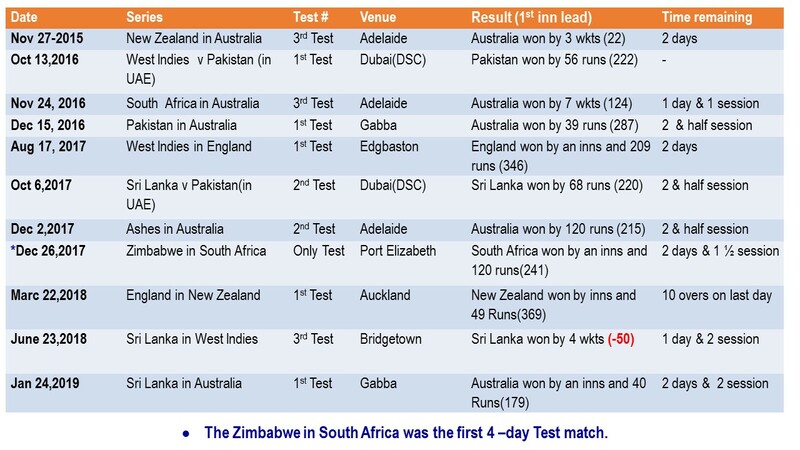 Interestingly none of the 11 Test matches were closely fought or had low margin of success. 6 Test matches got over with day or more to spare. Sri Lanka is the only touring team to win away from home under lights. They won in West Indies(2018) and in UAE v Pakistan(2017). In a test match, big scores keeps your opponent in arms distance for most times. Hence a substantial lead (of > 100 runs) in 1st innings is key to winning matches. Interestingly there were six 200+ runs 1st inn lead in day/night matches!. If your lead is less than substantial, then chances of winning or saving the test is very thin. In rare case Sri Lanka happen to win(by 4 wkts) in West Indies after conceding -50 Runs lead. Batting in fourth inning is a tough task, hence we finds low scores in last innings of a match. However in 2016 at Brisbane, Pakistan manage to score 450 in 4th inn under lights. This was only the 20th time in history of test cricket a team managed to score 400 in 4th inns. Nevertheless Pakistan lost that test match by 39 runs chasing 490 runs. They had conceded a massive 1st inn lead of 287 runs!.